Hey, Kitties. I know you and your humans probably got a ton of calendars for the holidays and January is almost over, but my author won a special limited edition one recently in a birthday contest for 17-year old Clyde that I think you should really check out before the last copies are gone. Not only does it feature cute cats, but it includes cat-related holidays, moon phases, and international holidays. Even better, the calendar is connected to a new cat book coming out featuring debonair black felines. The calendar and book both support a pawsome project that I want to share with you. The entire black cat initiative to raise awareness and shelter adoption rates began as a Kickstarter campaign last summer. It’s a 501 (c) 3 nonprofit for the book, calendar and all merchandise. 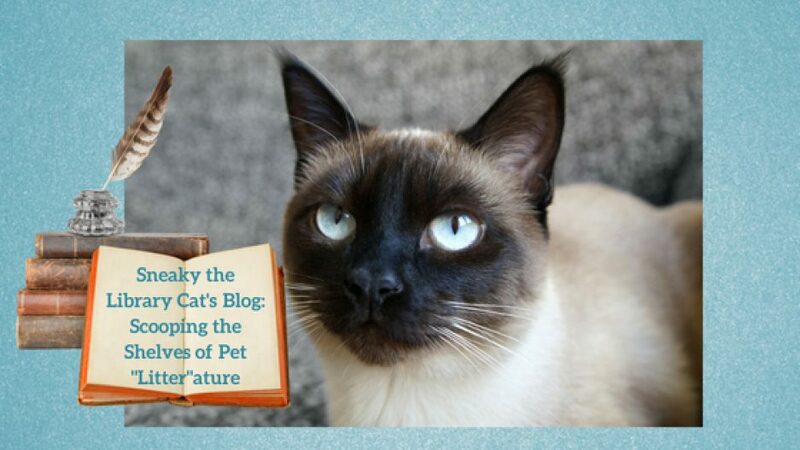 I’ve included a video testimonial by Chris Poole from Cole and Marmalade, two of my favorite video cat actors, that explains this purrfectly wonderful project. The Black Cat Tells All book is due to be released in early Spring, 2017 with pre-orders available in February. Clyde and the editor and author of the one of the stories who is also the founder of the Black Cat Initiative, Layla Morgan Wilde, are very busy now preparing for the book release, but I would very much like to interview Clyde one day soon. Below are links for more information about the Black Cats Tell All book, the initiative, and Layla Morgan Wilde. TBIF (Thank Bastet It’s Friday). For the feature film this week, I decided to post one about funny Siamese cats. As you know, although I am a book character, I am a member of this breed, as is my author’s real-life cat, Oliver. Like some of the Siamese in this film, he can be quite amusing and talkative. I hope you get a laugh out of this funny cat movie. What a lucky cat character I am to have two new guests on my blog today. Can you please introduce yourselves and your author? Svetlana: I am Svetlana, Kitty Mistress of Moorehaven, and my author is Morgan C. Talbot. Oh, and that fluffy tabby back there is young Rex. He is merely two years old, but I will kindly allow him to answer one or two questions if he is a good kitty. That sounds purrfect, Ms. Svetlana. What book(s) have you appeared in? Please list them and their genre. Svetlana: We live in the Moorehaven Mysteries series, which only has one book out so far: Smugglers & Scones. Our world is very cozy, and comes with plenty of yummy food! There’s lots of food in my Cobble Cove mysteries, too — special PB&J sandwiches, delicious muffins and cookies, and tons of tasty scraps from the library staff lounge which I enjoy sneaking bites of (my name is “Sneaky,” after all). Can one of you tell me more about your series? It sounds pawsome. Svetlana: You may speak now., Rex. Be polite. Rex: Yes, Svetlana. *ahem* Moorehaven Mysteries is a series set in the small town of Seacrest on the Oregon Coast. Moorehaven is a Victorian B&B, which used to be the home of world-famous mystery author A. Raymond Moore. All the humans in Seacrest know about murder mysteries because of him. And all of the guests who come to Moorehaven write mysteries, too. Our owner, Pippa Winterbourne, runs Moorehaven, so we get to sit on all the laps and computer keyboards we can find! The B&B has so many windows for us to gaze out of, it’s great. Plus there’s all the kitchen leftovers. Pippa and her Uncle Hilt make the best breakfast food I’ve ever eaten, and if I sit in the kitchen window sill and stare at them long enough, they’ll give me some! Svetlana: Yes, that is enough, Rex. Thank you. I apologize for his youthful exuberance. No apologies necessary. Rex did very well. While I’m a library cat, I sometimes pay visits at the Cobble Inn which used to be run by a nice lady named Dora when my author’s main character, Alicia, first came to town. Now her friend Gilly is in charge, and she is just as good a baker. Alicia is a librarian and is a co-author of a mystery series, so we have a lot in common. Svetlana: No, Rex, I will answer this one. You are too young and get the facts wrong. Now then. Rex and I are not based on real cats because our author’s husband is allergic. Such a tragedy, I know. But in our book series, we are both named for characters from Mr. Moore’s fictional bestsellers. It’s a rule of Moorehaven: the B&B must always have two cats, and they must always be named for characters from Mr. Moore’s novels. I am named for a gorgeous Russian spy, as you might have guessed, in The Alabaster Guile. Rex, well, he is less interesting. He was a bodybuilder who got mixed up with the wrong crowd in The Brass Artifice. But Rex is very lovely to snuggle with in window sills during the winter. And he licks my ears. He really is a good kitty. Even if he is just named for a musclehead. How interesting. What do you like most about your role in your author’s books? Rex: Hey, I like being named for a musclehead! Actually, I think it’s neat that we’re named for characters in bestselling books. Moorehaven is a mansion with over a hundred years of history—and mysteries of its own—and we get to live there and be part of its atmosphere. Writers and cats have always been natural allies. Except, y’know, when keyboards are involved. I’m proud of my job to help set the tone of the B&B and the book we’re in. Svetlana: That was a decent answer, Rex. Very decent indeed. Don’t be so hard on him, Svetlana. Are you talking cats in your books or just a silent one like I am who just meows occasionally? Svetlana: We don’t speak, but with our body language, we offer a kind of color commentary on the life and excitement in Moorehaven. Rex: Yeah, you are a white commentary, and I am a tabby commentary. Svetlana: No, just no. You should probably stop talking now. MOL (Meow Out Loud). Give the Kit a break. He’s just got a weird sense of humor. Svetlana: Be cats. Everyone who knows cats will know when you get it right. And beware of dog characters. They are all spies for the humans. I agree cats are the superior species, but my co-star is not a spy. Fido is just a dumb dog even if the human characters treat him the same as me. Cats make much better spies especially the “sneaky” ones like me. Svetlana: Our author is hard at work on the second book in our series, which is tentatively called Burglars and Blintzes. But its release date is classified Top Secret. Even I don’t know it. Hmmm. I hate when authors keep secrets from us characters. Debbie has the third book in our series coming out soon and a reprinted version of our first, A Stone’s Throw, but the only thing I know is that she may have taken my advice and put my photo on the cover of Written in Stone. Actually, it’s not my photo but another Siamese model. I also noticed, when I peeked at her screen, that she was adding some new scenes featuring me in more adventurous roles. That was after I complained about the silly storytime and annoying vet scene she cast me in our second book, Between a Rock and a Hard Place. I guess my blogging has opened her eyes to my true talents. Svetlana: Our author has these social media links you speak of. They are just distractions from petting us, you know, but I will slip you the information you need anyway. You owe me a treat for this, okay? No problem. I always keep some catnip on hand to loosen up my guests, so go ahead, and I will share some with you and Rex, too. I’m such a clever kitty, just like the spy I’m named for! And quite modest, Svetlana. Thanks for the interview, and best whiskers to you, Rex, and your author on your upcoming books. I have the honor of interviewing two cats today. One shares the namesake of my author’s cat, Oliver, and the other is named Max. Good day, lads. Welcome to my blog. Can please you share with my readers the name of your author and what books you’ve both appeared in? Max meows: Our author is J. Schlenker. She wrote “The Mysterious Butler and Other Life Mysteries” (A Collection of Short Stories). Oliver and I are in the story, Nine Lives, in that book. Oliver says: One of my lives, the one of Buddha, is based partially on a true story about my author’s cat. Oliver announces: This is me starting to tell my tale. “You look old,” the white fuzz ball of a kitten said, keeping a cautious distance from the fat cat. The old cat, almost the same color as himself, but marked with age, sat curled up next to a bowl of milk. “If you’re looking to get some of my milk, that’s no way to go about it,” the fat cat replied with a sluggish raise of his eyelids. “Ugh,” the fat cat grunted, dropping his eyelids back down to a narrow slit. The small kitten edged closer but toppled over on the fat cat after being distracted by a butterfly. “You don’t have to be mean,” the kitten said, jumping back and sliding over on its side. “When will that be?” asked Max. “How about tomorrow? No, make that next week,” the big fat cat said, hardly moving his lips, as it took up far too much energy. But Max just sat there silently, staring. The big cat half-opened an eye and cringed. “You still here?” Max sat in silence, all wide-eyed. “What’s wrong? Cat got your tongue?” The big cat almost laughed, but his rheumatism was acting up, so he stifled the urge for any kind of movement, even his mouth. “I just want to know,” Max said, keeping his position, remembering what his mama said, show no fear. “Oh?” Max questioned in awe. Max looked down in disappointment. “Why was not being a beautiful princess good?” Max interjected. That was pawsome. Thanks for that purrfect excerpt, Oliver. You and Max are great cat actors. Oliver answers: Educating Max. Possibly he can avoid some of my mistakes. You are doing a great job. I’m sure he appreciates that. Oliver replies: Really, I’m not much of a talker or a meower, mostly a lounger in my old age. I see. With age, comes wisdom. Oliver states: Not all dogs are bad. Very true. My co-partner in the Cobble Cove mysteries is Fido, a golden retriever. He’s a nice guy but not all that sharp. I’ve also just started featuring dogs and other animals on this blog. I still think cats are the superior species, though. Max explains: Our author J. Schlenker’s current project is Sally. It will be fictional history, based on a woman she met when she was eight years of age. She was born into slavery in 1858. She lived to be 110 years old. Our author projects it will be out in late spring or early summer. That sounds very interesting. I will tell my readers to keep an eye out for it. Thanks for the interview, guys. Paws-up to you and your author on your future books and best whiskers also to your author on her participation in Mystery Thriller Week. Hey, folks. Since it’s January, I thought I’d show some winter films for Feature Friday. I don’t condone letting your cats out in the snow, and some cats hate getting their paws cold and wet, but these clips show that some kitties enjoy a supervised frolic in the white stuff. My author Debbie keeps her cats inside except for an occasional sit out on her enclosed patio. As for me-ow, I’m an indoor character cat, too, enjoying my very own room at the Cobble Cove library and the window seat in the Children’s room. I realize some of you reading this are in places where it never snows, and others who have snow almost all winter. Here in NY, we’ve had two storms so far, but they’ve been washed away by rain as temperatures rose afterward. I hope you enjoy these funny snow cat videos.